Sandhill cranes linger before sunset at Bosque del Apache National Wildlife Refuge. Every October, a distinct sound issues from the skies above the Rio Grande Valley. It’s tricky to describe—one part rattle and one part squawk—but once you hear it, it’s hard to forget. Along with the smell of roasting green chile, the descent of the sandhill cranes into the valley is a sign that autumn has arrived. Every fall, thousands of the cranes migrate from the northern Rockies to spend their winters along the Rio Grande, hunkering down at places like Bosque del Apache National Wildlife Refuge south of Socorro. Typically, they have arrived by Halloween, and they stay through February. But this year, their numbers are lower than usual. The most recent survey at the refuge estimated that there are about 4,800 sandhill cranes and 12,700 snow and Ross’s geese. 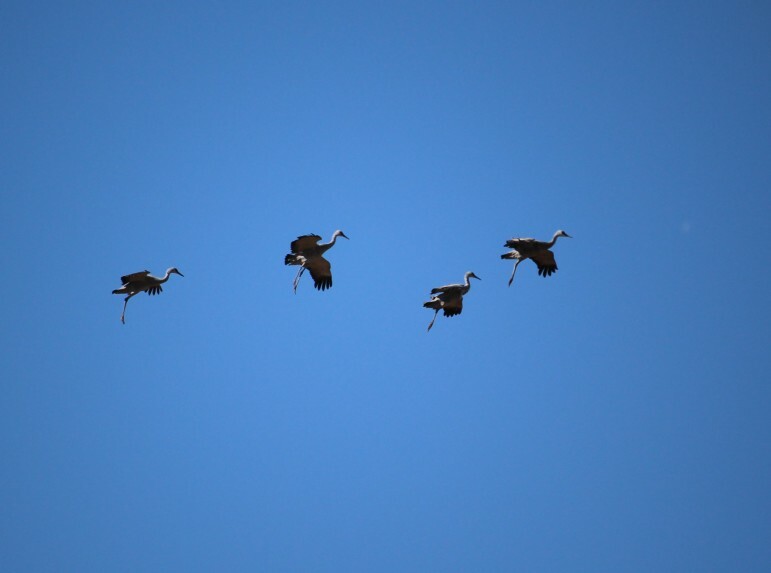 “There are probably one-third to one-half of the cranes we normally have this time of year, spread out through the valley,” says Bosque del Apache refuge manager Kevin Cobble. They’re still to the north, he says. “It’s a good strategy.” If it’s warm enough and there’s enough food, “it saves a lot of stress when they don’t move,” he says. It’s not only the Rocky Mountain population of cranes that are putting off their winter migration. In early December, Midwestern cranes were still in Wisconsin. The birds are staying put in the region for now, thanks to the unseasonably warm weather combined with plenty of harvested farmland for foraging. Most if not all of them could be here through Christmas, according to an expert with the International Crane Foundation (ICF) in Baraboo. “The forecast for December is unseasonably warm, driven in part by south winds, and they’re thinking to themselves, ‘why should we migrate if it’s warmish, and we can’t migrate if there are south winds,’” said Anne Lacy, Crane Research Coordinator for the Foundation. According to the National Oceanic and Atmospheric Administration (NOAA), this October was the warmest October on record. And it marked the sixth consecutive month that a global temperature record had been broken—and was “also the greatest departure from average for any month in the 1630 months of recordkeeping.” Furthermore, the October temperature is currently increasing at an average rate of 0.06°C (0.11°F) per decade. Snow geese land at a pond at Bosque del Apache National Wildlife Refuge. On a Wednesday in early December, the temperature is already hitting 63 degrees at half-past noon at the refuge. 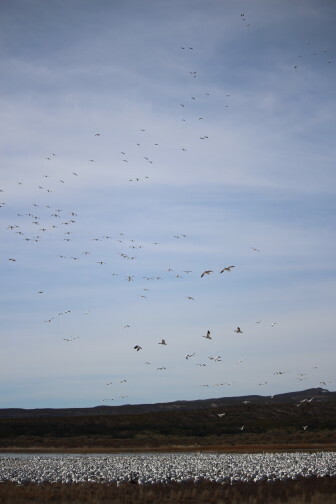 At the very first pond along the road, more than a dozen visitors—some outfitted in camouflage, most with giant lenses for their cameras—watch a few hundred snow geese kettle down from the sky. It’s noisy and wild as the geese land at the pond. 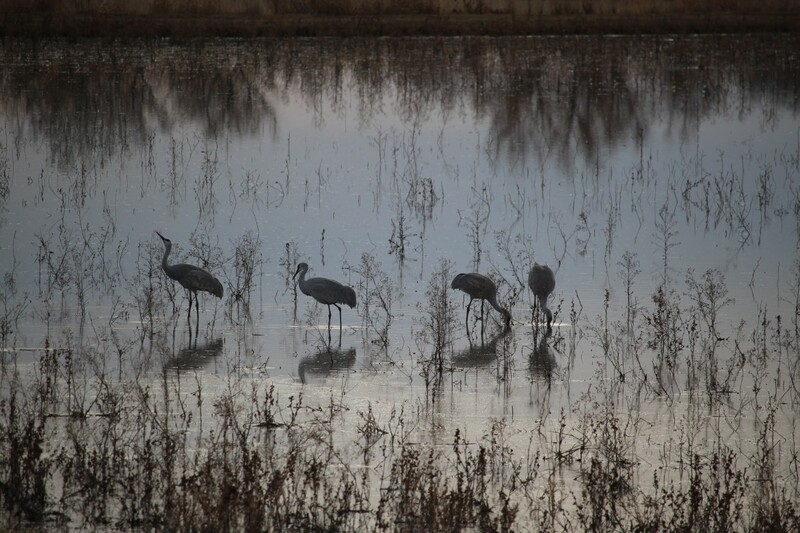 A few cranes stand in the middle of the raucous. And the visitors seem elated. They’re standing yards from hundreds of snow geese. In the afternoon, Cobble heads out into the refuge, driving down back roads where visitors aren’t allowed. He’s checking out a few places where tamarisk—a dense, water-sucking invasive plant—has been removed recently. Raptors sit atop snags; the truck spooks a great horned owl. Cobble hops out to check a new, more efficient head gate for moving water that was installed this year. And of course, he’s on the lookout for cranes. A handful walk through a spit of water within a cottonwood forest; a dozen feed alongside a field of milo. Then, driving past a field of blue corn, the air is suddenly filled with their guttural cooing. Cranes stand up from within the corn stalks and look around. A few take flight, most get back to feeding. Thanks to the warmer winters, javelina have also migrated northward, says Cobble. Within the refuge, he estimates there are about 200 of the animals, which travel in small groups and like foraging in the corn. “Thirty years ago, there were no javelina on the refuge,” says Cobble. “Now, they’re one of the most abundant large mammals on the refuge.” As winters have become less severe, he says, they’ve moved north into New Mexico—and will continue expanding up the valley. The US Fish and Wildlife Service manages more than 500 wildlife refuges across the nation—and the agency is concerned about how climate change will affect many of them. In 2014, the Service released a report, looking at how the refuge system can plan for things like increased wildfires, sea level rise, and permafrost thawing. For desert refuges like Bosque del Apache, the issue is often going to involve water supplies, says Cobble. In New Mexico, as the spring runoff arrives earlier and often, in lower quantities, that affects river levels and the wildlife that depends upon its flows, including endangered species such as Rio Grande Silvery Minnow and Southwestern Willow Flycatchers. Dry times also increase competition for water among state, federal, and local users. “And we’re at the end of the ditch,” says Cobble. That is, the refuge receives its water from the Rio Grande after cities like Santa Fe and Albuquerque and farmers irrigating within the Middle Rio Grande Conservancy District. And sometimes, there’s not much left. While the refuge uses most of its water in the winter—after irrigation season for farmers has ended—it still requires access to water year-round. Ponds are drained and filled, crops like corn and milo are grown, and the cottonwoods, willows, and other native vegetation need water to survive. Cobble is clearly troubled by the impacts of climate change, at the refuge and across the globe. And he admits they were a little worried about the lower bird numbers this year as the annual Festival of the Cranes was approaching. Sandhill cranes come in for a landing. But he says the lower numbers of birds so far this season don’t diminish the visitor’s experience. But, don’t wait too long to check out the cranes. Laura Paskus is an independent reporter and radio producer. She freelances for national, regional, and local media outlets and has worked as assistant editor of High Country News and managing editor of Tribal College Journal. Before becoming a journalist, she worked as an archaeologist and tribal consultant.